There also general milestones within the process that must be complete prior to moving to the next stage. Static tests are performed upon installation, these would include electrical conductor testing, duct and piping leakage tests, and visual inspection of installation, etc. Once static tests are performed and verified, permanent power can be connected. Once powered pre-start procedures are performed and the manufacturer's representative performs a start-up of the newly installed item. Once power and start-up are verified, dynamic testing is performed. Dynamic tests would include water and air balancing, electrical systems testing, load bank testing, etc. All of these items are verified and some witnessed by the commissioning authority. 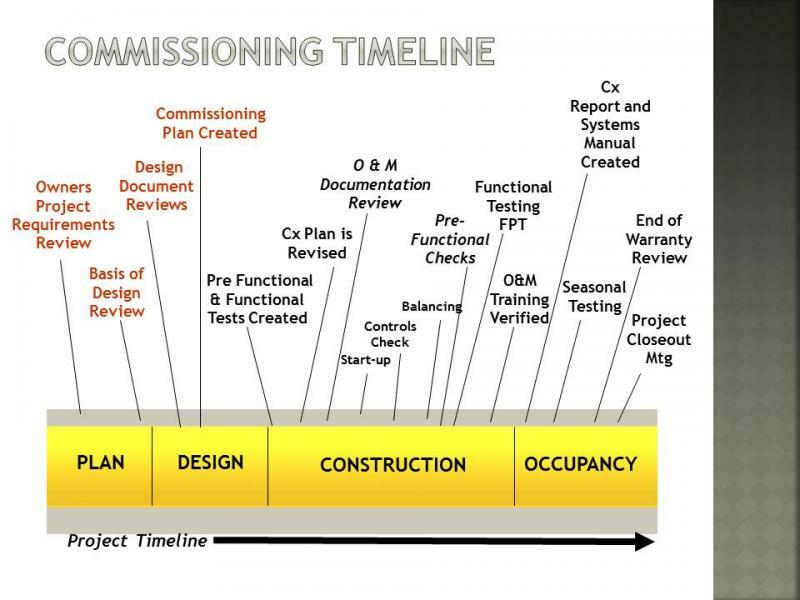 The commissioning team which includes representatives from all contractors, the owner, and the commissioning authority utilize prefunctional test checklist forms created by the commissioning authority to verify completion of these items. Once all prefunctional checklists are complete, the commissioing authority performs his back checks and the process moves to functional testing. Each system is tested individually and then together as one large integrated system.